Think of the main, honest reason you homeschool. If you could only give one answer, what would it be? Do we all have a different answer or are there common reasons we homeschool? Apparently, this is a difficult question, because when I asked this question on social media I had several people not even attempt. “I can’t give just one!” said an overwhelmed mom. “Because.” said another mom, in no mood to open that can of worms. Ever again. And this angst was a discussion among homeschoolers. I got some great responses that all hovered around ten common and brutally honest reasons we homeschool, which I will share below. But, it gets trickier when we are asked by someone who doesn’t homeschool. Should we be honest or politically correct? Recent horrific news stories have used “homeschooled” as a sensational trigger word, unfairly casting homeschooling in a conflicting light. Certainly, it is a cheap societal scapegoat. But could we be partially to blame for the continual suspicious perception of homeschooling? “Wow. Homeschool, huh? So that’s like a real thing?” said the curious stranger, or the alarmed friend or family. Put us in a petri dish and poke us with a number 2 pencil already. We really are a curious alien life form to many. And even if you decided to homeschool from child birth, when your kid gets big enough to look odd sipping a latte with mom at the bookstore at 10 am on a Tuesday in February you are going to be asked at least once why your kids aren’t in school. Anyway, some odd years ago a few feisty moms in denim and station wagons braved scornful glares and the fear of being reported for anything slightly uncouth and dared to step out in public with their half-citizen offspring. It was more likely at that point in homeschool history for an innocent cup of coffee to end up coffee with child protective services during a home inspection. But it is your prerogative to avoid the looks and questions and stay home in hiding. But for the most uninformed and programmed mainstream American, stumbling upon a homeschooler for the first time is like wandering into the freak show tent and seeing the bearded lady teaching grammar. 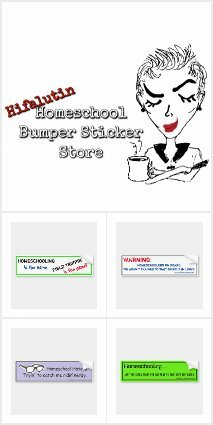 Homeschooling continues to grow as public education continues to spiral downward and our government becomes more contemptuous of the family unit, and still this perception that homeschoolers are “different” and “estranged” continues. But I’m just as guilty of using this favored cop-out answer and it made my readers’ top 10 list of reasons to homeschool. The first few months after we became “that homeschool family” there was no stopping the truth bombs I would launch when asked why we chose to homeschool. Like a bad case of diarrhea of the mouth, I told anyone and everyone who asked all about our trying experiences with the mediocre public-school education our kids were getting. And I conveyed our concerns of bullying, and the morally bankrupt influences on our kids. Yes, I once spouted what led us to our decision to homeschool bluntly and unapologetically. But quickly it became apparent that my honest concerns were perceived as hifalutin and judgmental to those who wouldn’t dare explore the world of homeschooling regardless of their own discontent. And especially those unwilling to acknowledge that government schools market to the loudest and most bankrolled lobbying group, and our kids are their cash-crop. See? There goes my mouth again. Our family is just peculiar different. For undisclosed mysterious and possibly shameful or criminal reasons. Don’t sweat it. You’re off the hook if you feel insecure about your own educational choices in relation to ours. Our issues only pertain to us because we are being purposefully weird special. Thanks for asking. Move along now. That’s what we want, right? To be left alone. And usually folks do just that. They move along. And speculate. And apply everything they hear in the news upon all homeschoolers. Because we told them we were different, but we didn’t explain why. I once wrote an article making fun of the way some moms are quick to concoct self-deprecating reasons and excuses NOT to homeschool when in the unnerving presence of a homeschool mom. READ, RELATE and LAUGH HERE! No, I’m not about to apologize for it. It was stinking hilarious! And it resounded with many homeschool moms who had no doubt been accused of being “really patient” by friends, acquaintances, and strangers who felt they needed an escape clause from homeschooling. I just don’t have enough patience. My kids won’t listen to me. My kid and I argue about everything. I just can’t be with my kids that much. I pointed out the hypocritical way they disguise their aversion to homeschooling as compliments for homeschool moms. And I am a hypocrite for doing the same. Okay yes, we are different. We had the gumption to leap into homeschooling despite the mainstream push for conformity. And we wear pajamas all hours of the day and talk about such things as second breakfast. The real reasons for homeschooling that parents shared with me are not concerns specific to homeschooling parents. In fact, some of us were public-school parents when the concerns got so great we braved a massive lifestyle change to ease them. I’m not saying we should engage everyone that asks in a debate of our beliefs and convictions about homeschooling. I still avoid a confrontation at all costs (most of the time). But what if the truth does sound better? The truth will no doubt cause some angst in our relationships with those who choose to continue to send their kids to public schools, possibly because our sound arguments resonate with them and bring on a certain insecurity. They get offended because whatever we say other than the PC response can be construed as a hit on their educational choice. Could our honesty affect change for others over time? Lead those hesitant to homeschool to brave the possibility because they see homeschooling in a new, less alien light? We like to be in control of our schedule and what values our kids learn. To ensure our kids are loved and safe from bullies and school shootings. We want our kids to get a top quality, personalized education. So our kids will learn to think and reason, not just regurgitate facts for a test. Our kids need time with their father, who they would otherwise never see. It is best for our family. The time with our kids will go by fast and we want to be together. We want to follow God’s instruction to educate our kids to live a Christian life. Acknowledging the blunt reasons we choose to homeschool may not convince anyone to homeschool. That’s cool. We aren’t recruiting sister wives or anything. But sharing our real convictions might help others to see that most homeschoolers are just strong families taking action against real world concerns. No alien agendas. Today’s education system is so outdated it doesn’t prepare our kids for the 21st century. There is nothing natural about the education system, it is beyond ridiculous that it even still exists and it needs a serious disruption.